Grove Street School, in the middle of Providence’s Federal Hill neighborhood, one of many small neighborhood schools was built at the turn of the Century and was in use until sometime in the late 70s, early 80s. The City, in an effort to divest itself of these small schools (in desperate need of repair after years of deferred maintenance) in favor of larger, more centralized schools, offered the Grove Street School for sale to interested parties under the agreement that the properties would be redeveloped within a certain amount of time or the properties would revert back to the city. Grove Street school continued to languish and calls to code enforcement did little to encourage the owners to do anything with the school. Neighbors eventually stopped calling and complaining because it was clear that complaints to code enforcement only caused them problems–several neighbors report having visits by Code officials at their own properties (on Ring and Grove Streets) after calling about the school. Meanwhile, many interested parties came calling on the Tarros, and other members of the community–wanting to buy or redevelop in partnership with the owners, and all were sent away. The revaluation of 2003 put the taxable value of this historic building, and the land it sits on at approximately $144,000. In 2002, this building was put on the Providence Preservation Society’s 10 Most Endangered Properties, where it has stayed every year since then. The Industrial and Commercial Buildings District ordinance was enacted to protect buildings such as these by designating them their own historic district. In the past 2 years there have been several attempts to damage the building to make it look like it is falling down and in need of condemnation, and at least two visits by demolition crews and equipment. A meeting with community members yielded interesting results. When asked what the owner intended to do with the property, they were told “Parking for the funeral Home.” When asked how many parking spaces they needed, it was not known. When asked how many parking spaces tearing down the school would yield, the owners suggested 60. When asked if that was enough parking to suit their needs, the answer was no. Last week, a neighbor reported talking to a contractor working in the building, pulling out radiators and other materials. When asked what was going on, the contractor replied that the building would be coming down on that Wednesday (January 30th, 2007.) The community once again mobilized, calling the Planning Department, the Mayor’s office, The City Council office, the Building Department, and the Providence Police Department and the community was assured that the building would not be coming down. No demolition permits had been pulled, and the Historic District Commission had not approved of the implied demo, but police were to monitor the property for activity and a Stop Work Order was affixed to the door of the building. The building did not come down on Wednesday, however contractors did arrive on site on Saturday morning and began demolishing the east side of the building. Area residents told the contractors of the lack of permits and the posted Stop Work Order, and yet they continued their destruction. Contractors finally ceased sometime after the police arrived on the scene. The Mayor and the City’s building officials arrived some time after that and a 24-hour police detail was assigned to the property. 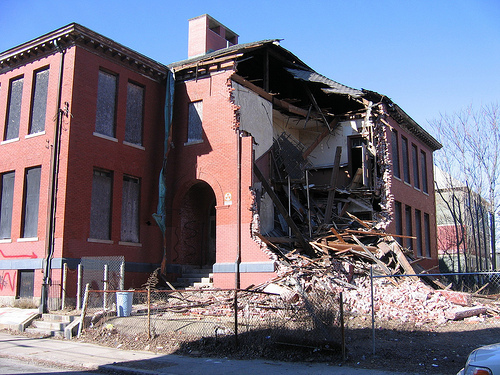 On Monday, February 5th, the Rhode Island Superior Court issued an Order Granting The City’s Emergency Motion For Injunctive Relief which states that no further demolition or alteration may be made to the Grove Street School. Additionally, the WBNA has been informed by city officials that they are looking at various actions to protect the building, including a Providence Redevelopment Agency meeting on Thursday, February 8th at 4pm at the Department of Planning and Development, 400 Westminster Street, 4th floor to hear plans for the acquisition of the Grove Street School from the current property owners. Greater City Providence believes that preserving the historic fabric of our city’s neighborhoods is vital to maintaining their livability. Certainly removing such a valuable structure as the Grove Street School for surface parking is not the direction that Providence should be going in. This building has suffered a massive wound, but it need not be fatal. The building can be saved and put to good use for the community. We urge the city to find a way to ensure that the future of this building is entrusted to someone who understands its importance to the physical fabric of the neighborhood. Furthermore we urge the city to enact new legislation that will strengthen the penalties against property owners who carry out illegal demolitions and the contractors they employ. The penalties are so minor now that a developer can knock down a wing of a building (as has been done here), receive their wrist slap, then continue with their demolition as they’ve now left the structure in an irreparable state. Let this be the end of the Old Providence way of doing business.